ROOM 1: The Winter Room is the best preserved room from the original Castle, and it was the most important of the King’s three private chambers. The bays are from 1758; in front of the bay to the right stood Christian IV’s mechanical arrangement for raising and lowering the drawbridge. Christian IV lay in state here and the exhibits are mostly from his time. The rich panelling was begun by Court cabinet-maker Gregor Greuss and were completed around 1620. 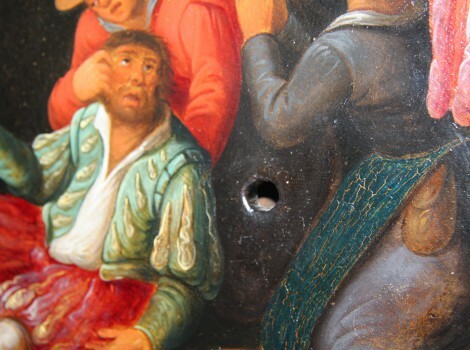 The inlaid paintings were purchased in Antwerp and constitute a unique collection of art from the Netherlands; however, most of the artists are unknown. 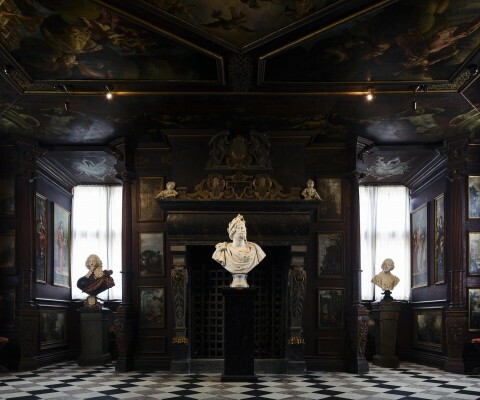 The original stucco ceiling was replaced around 1770 with Pieter Isaacsz’ mythological paintings, including The Feast of the Gods and The Fall of the Giants, which were moved from the room above. A speaking tube connects the Winter Room to the Wine Cellar, to the room above and to the gable room at the opposite end of the Castle. 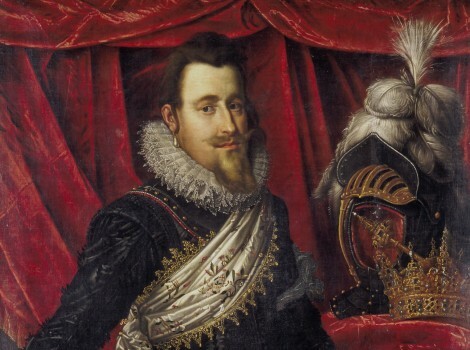 In the cupboards on the south wall, Frederik IV kept his private chamber of curiosities, which included spoils of war from the Palace of Gottorp. 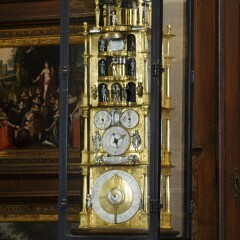 It later became part of the private collections of Frederik V in Christiansborg Palace and Kunstkammeret (The Chamber of Curiosities). 100. Goblet in the form of a young knight (Christian IV), tilting at the ring. 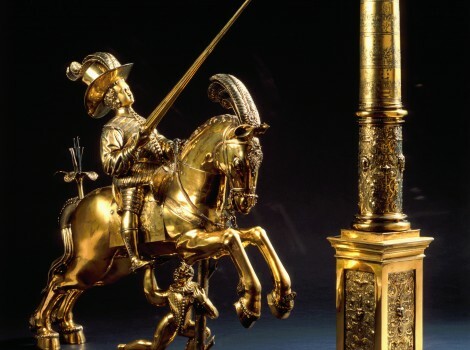 Made by the goldsmith Heinrich Beust in Brunswick in 1598, commissioned by the King and paid for with the prizes he had won at tilting during the coronation celebrations. The names and arms of the King’s fellow competitors are engraved on the columns. When Christian IV had to sell his royal plate after the defeat of 1628, he kept two pieces, a christening present – and this goblet. 101. 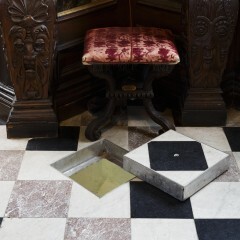 Table with inlaid semi-precious stones from Christian IV’s Oratory in the chapel of Frederiksborg Castle. Florence, c. 1620. 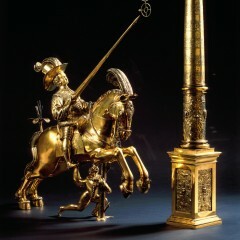 Stand with Frederik III’s monogram and motto: Dominus providebit (the Lord will provide) from c. 1660. 102. 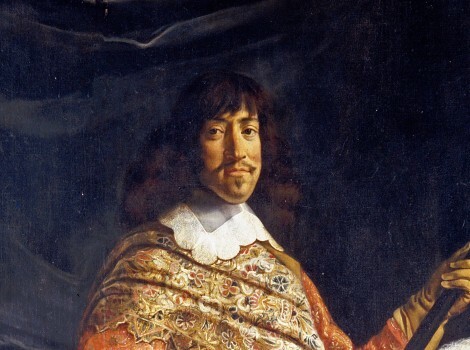 Christian IV. 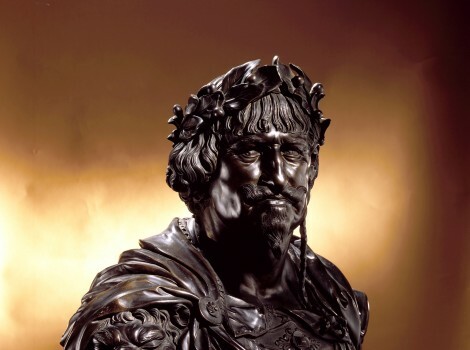 Marble bust, made in Copenhagen in 1644 by François Dieussart. 103. Renaissance chairs, upholstered in silk velvet brocade interwoven with the King’s cipher, C4. 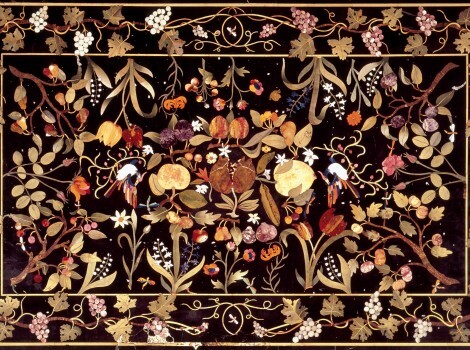 Made at the silkfactory in Copenhagen c. 1623. 104. Stools carved by Christian Nerger c. 1690, upholstered as no. 103 (cf no. 213). 105. 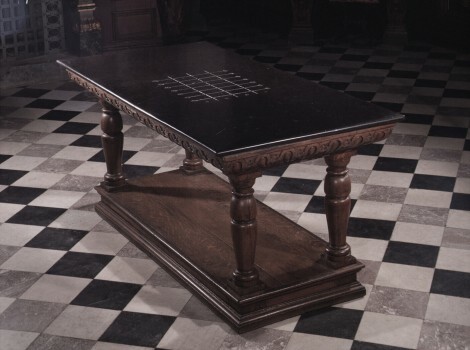 Table with stone top, in which are cut lines for a game, probably originally intended for use as a calculating board, but also used as a “shove-halfpenny” board. Stand from 18th century. 106. 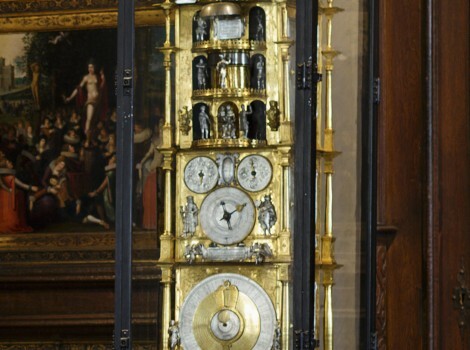 Astronomical clock with musical works and moving figures; made in 1594 by Isaac Habrecht, one of the makers of the famous clock in Strasbourg Cathedral; it is partly a copy of this. Transferred to Copenhagen from the Cabinet of Curiosities at Gottorp Castle in 1764. 107. Marble bust of King Charles I of England (1600 49). Made in 1633, probably by Pierre Besnier. 108. Marble bust of Queen Henriette Marie of England (1609-69), King Charles I’s Queen. Made in 1640 probably by F. Dieussart. 109. Calendar table, dated 1638. On the cover a portrait of Christian IV, probably by Adrian Muiltjes. As a king one was obliged to perform a number of duties, including recieving various guest of high and low, oftentimes in designated audience rooms. 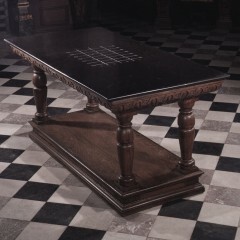 Table with stone top, in which are cut marking lines. It was originally intended for use as a calculating board, but also employed as a “shove-halfpenny” board. Foot from 18th century. Gilt silver figurine of Christian IV. Made by the goldsmith Heinrich Beust in Brunswick in 1598, commissioned by the King and paid for with the prizes he had won at tilting at the ring during the coronation celebrations.